Flag Day observed in honor of our nation’s colors - The Delta Discovery, Inc.
On June 14, 2017 flags across the nation that were ready for retirement, including here in Bethel, were honorably decommissioned through flame in a Flag retirement ceremony. June 14 is designated as our nation’s Flag Day. The Bethel Cub Scouts Troop 556 assisted the Veterans of Foreign Wars Post 10041 during the Flag Retirement Ceremony. Over 300 flags were honorably put to rest including the large flag that had flown over the U.S. Fish and Wildlife Service building and a flag with beautiful yellow-fringe that had flown over YKHC. Many of the other flags were from gravesites at the local cemeteries and from the Alaska Territorial Guard Park. And there was also an Alaska Flag that was put to rest. Each year VFW Post member Buck Bukowski teaches the Boy Scouts about flag etiquette. Other scouts present at the ceremony were Russell Webber and Daniel Jang along with Cub Scout leader Tamy Rogers and Webelows leader Hannah Jang. It was not until August 3rd, 1949, that President Truman signed an Act of Congress designating June 14th of each year as National Flag Day. If you have a torn, tattered flag that has done its service and is ready for retirement there is a flag drop-box at the VFW Post where you can deposit it for the next Flag Day Ceremony. 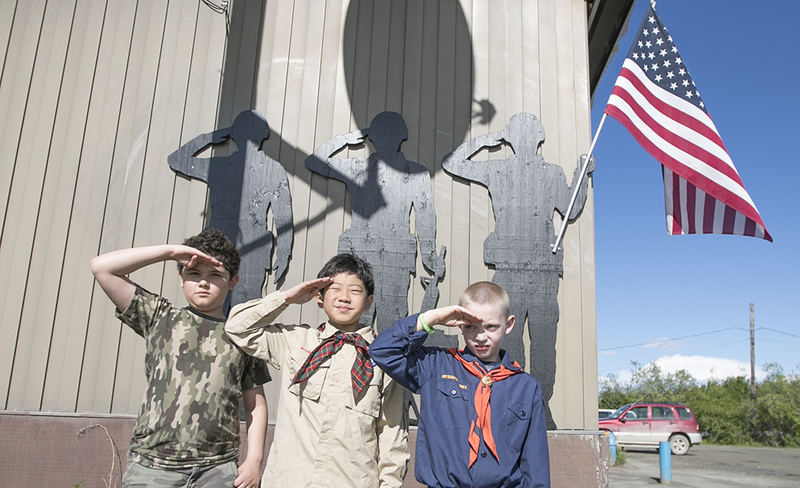 Cub Scouts salute the American Flag like the shadow silouette artwork behind them at the VFW Post 10041 in Bethel on Flag Day. From left are Alejandro Rogers, Daniel Jang, and Russell Webber.